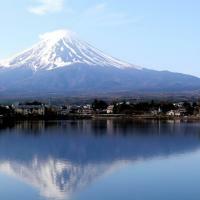 Making your way to the hot spring resort town of Kawaguchi-ko with a Host, you’ll enjoy some of the best views of Mount Fuji in Japan. Soak up the reflection across the lake, the blankets of peaceful moss phlox and calming fields of lavenders and blueberries. Weave your way through Kawaguchi-ko’s wealth of natural resources, including sights of the biggest and most accessible of Fuji’s five lakes, and depending on when you visit, the stunning autumn leaf foliage, cherry blossom tree phenomena or flower festival season. 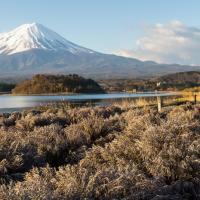 With your hand-selected Host, float through the Kawaguchiko Natural Living Centre, perhaps you’ll then head to an onsen hot spring spa, a music forest, one of the area’s art museums or simply admire the seasonal delights at the best of Fuji, with the added bonus of Japan’s most famous mountain in the background. Your Local will create a bespoke itinerary to suit your needs, helping you to harmoniously immerse yourself in the rural surroundings and allowing you to fully become one with Japanese nature. Perhaps you’ll ride the Mt. 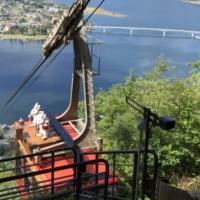 Fuji Panoramic Ropeway and see the incredible views of Mt. Fuji and Lake Kawaguchi from a height, or maybe you’d prefer to coast through the fairy-tale setting of the Music Forest Museum for a more unusual experience, browsing a collection of automatic musical instruments. Explore the unique, world-renowned work of the ancient art of fabric dyeing at the Itchiku Kubota Art Museum and Maple Corridor. Admire the beautiful kimono depicting themes of nature and the cosmos and the unfinished masterpiece "Symphony of Light"; a piece comprising 80 kimono that together form a picture of Mount Fuji. Sip a green tea in the tearoom with views across the lake and wander the gardens of mini waterfalls, forests and tunnels of trees. If an hour of relaxation sounds more like it, try one of the many hot spring baths across the Fuji Five Lake region. Some come with stunning views of Mount Fuji, such as Yurari; a modern, beautifully designed public hot spring facility home to 6 types of baths with the idea of feng shui and Hado-art. With a variety of gender segregated indoor and outdoor baths, a Reiho open air bath, a cave bath, and a Goemon bath (where the metal bathtub is heated from beneath), the experience will be sure to relax you and stimulate the senses. Discover the hidden gems in the scenic Kawaguchi-ko area that are just around the corner from iconic Mt. 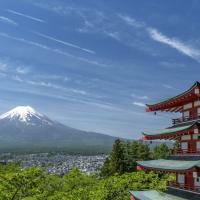 Fuji, and experience Japan’s natural beauty in a new light with your Host by your side, who can also give you recommendations for other things to do in the area during your travels.